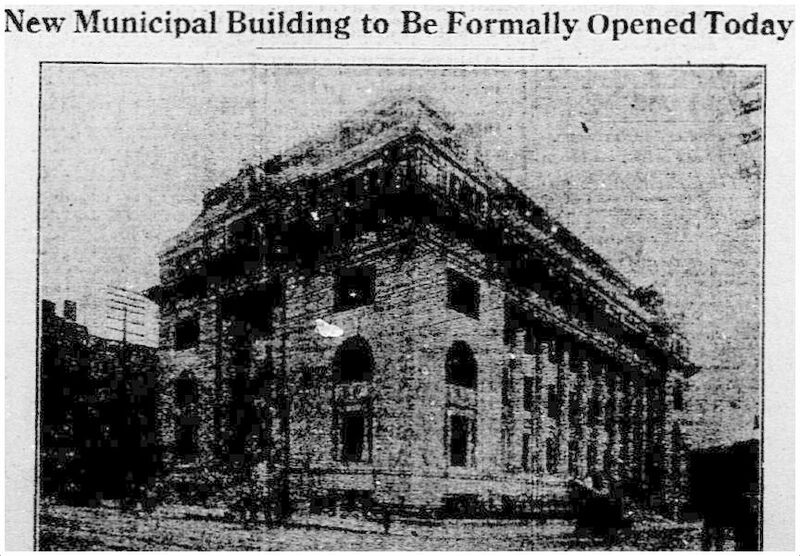 Appearing in the May 7, 1914 issue of Municipal Journal was a short article on Dallas’ then-under-construction Municipal Building and a drawing of what it would look like when completed. Dallas, Tex. – The new municipal building of the city of Dallas is nearing completion and will be ready for occupancy in a few months. It will house all of the city departments and in addition will have a modern emergency hospital in the basement and public rest rooms for both men and women. The building is said to be a radical departure in architectural design from the usual type of public buildings in the South; it is constructed along simple but dignified lines. The structure will be of steel construction covered with blue Bedford stone, the five stories, basement and sub-basement will be a home worthy of the city of the hour, as Dallas people like to call their town. Ventilating and heating systems are being installed together with vacuum cleaners. The building, without furnishings, will cost about $550,000. 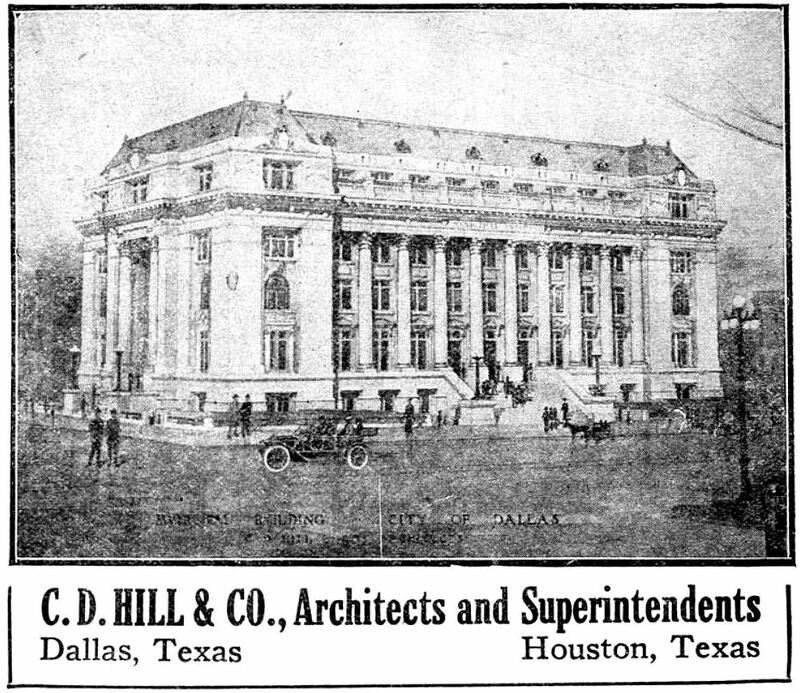 C. D. Hill and Company are the architects. 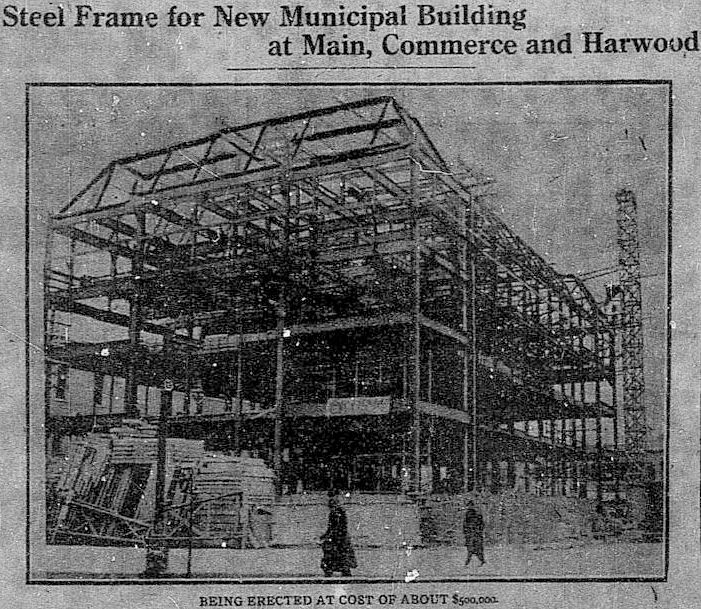 The structure was started by the Fred A. Jones Building Company, which failed just as the steel was up, and it is being finished within the estimates by the city under the supervision of the architects. 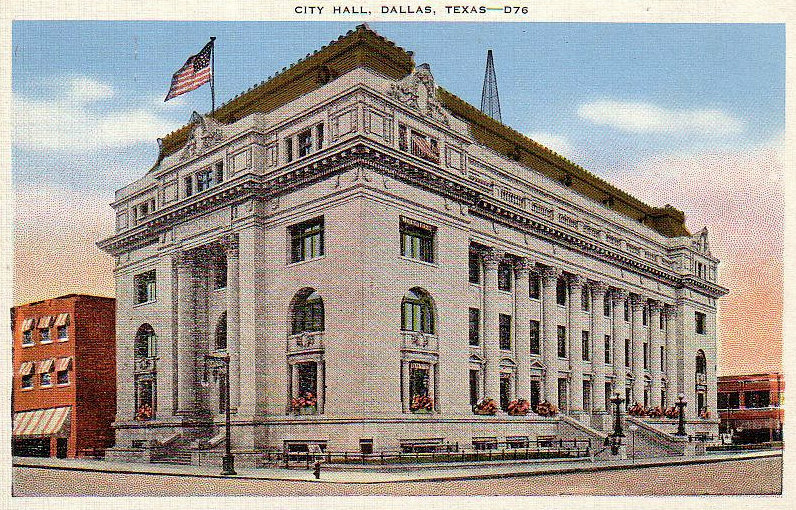 This new City Hall, located at Main, Harwood, and Commerce, was designed by Dallas architect C. D. Hill. Construction began in late 1913 — by January of 1914, its steel frame was in place. The cornerstone was laid in a Masonic ceremony on Valentine’s Day, 1914. 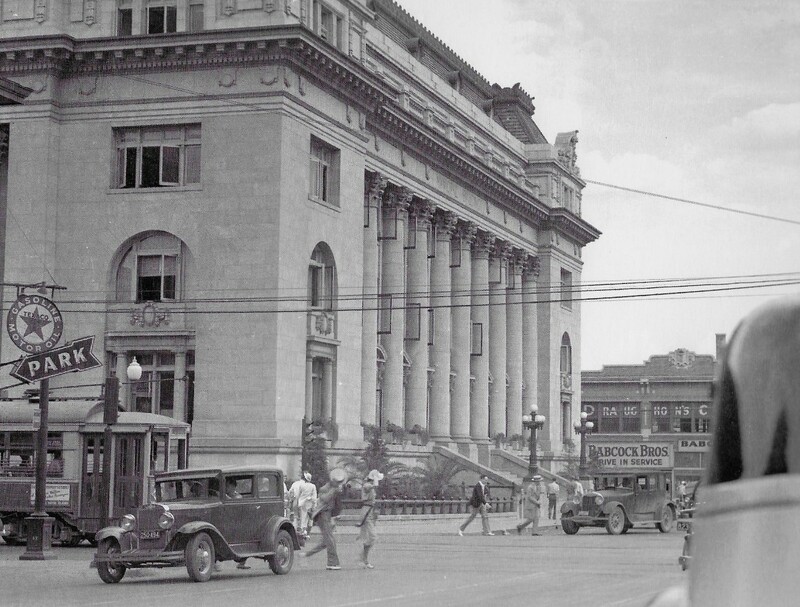 The building was officially opened on October 17, 1914. Here’s a grainy photo that absolutely does not do that beautiful building justice. When the doors were finally opened to the public, it was expected that a few thousand people would show up to tour their new municipal building — in actuality, the much-larger-than-anticipated crowd numbered somewhere between 12,000 and 15,000 curious Dallasites. The beautiful exterior was faced with granite and stone, and the interior boasted marble, mosaic tilework, and wood paneling. All of the furniture used in the building was made in Dallas. In addition to the mayor’s office, fire, police, and other municipal departments, the building also housed an emergency hospital, a sub-basement shooting range (! ), and, on the 3rd floor, an 1,100-seat auditorium, with a 4th-floor gallery. (The auditorium was designed so that if, in the future, it was determined that it was not needed, it could easily be converted to office space by adding a few columns and beams — a renovation which obviously happened at some point.) Interestingly, the northern half of the top floor was left unfinished as the space was not needed at the time. ALSO included in the new building’s amenities were much-needed public restrooms (or as they were euphemistically referred to back then, “comfort stations”). A men’s restroom and a women’s restroom (“positively divided with heavy walls”) were located under the Main Street sidewalk, accessible down stairs on either side of the building’s entrance. Up until this point, there was only ONE public “comfort station” in the city (for women and children) — at Fair Park. So for most downtown visitors, this might well have been the most exciting aspect of Dallas’ newest landmark. 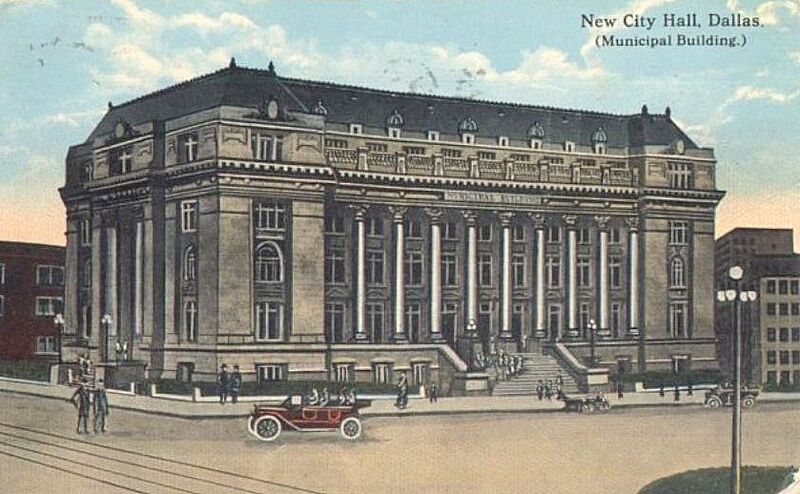 The building referred to as both “City Hall” and “the Municipal Building” was considered to be one of the city’s finest and most elegantly imposing. But there are always a few people who just don’t like nice things, and there was a surprising amount of vandalism to the building in its first few weeks. 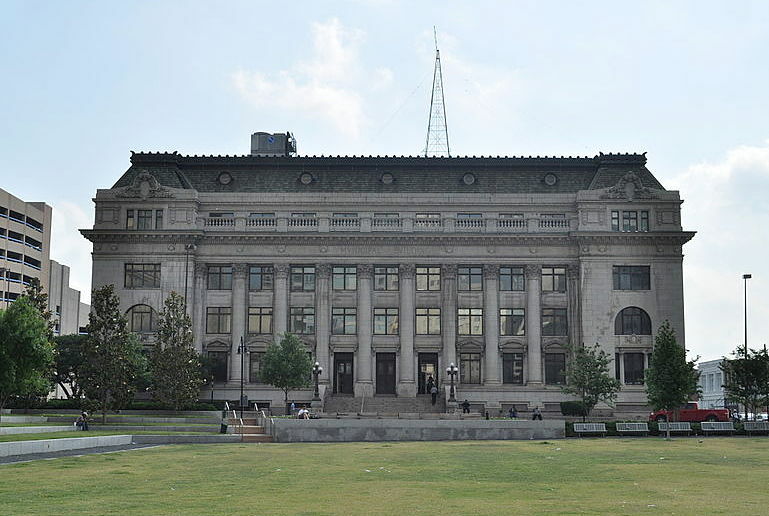 This is one of the truly great buildings in Dallas, and it just recently celebrated its 100th birthday. It is a Dallas Landmark and a Texas Recorded Historic Landmark. No longer a city property, it is now part of the University of North Texas Dallas College of Law campus (along with the old Titche’s building). 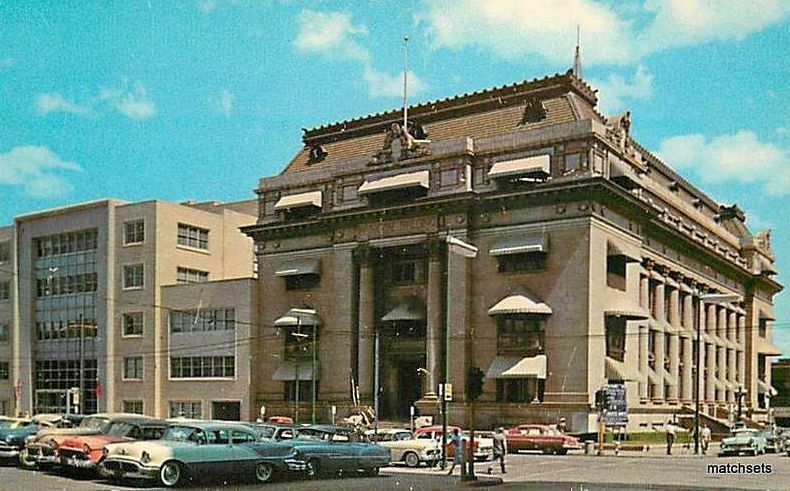 UNT is currently working to restore and renovate this beautiful historic building. Thank you, UNT! Then there was a weird middle-age-crazy period when someone thought that the addition of awnings would be a good idea (that person was incorrect). And, today, it’s back to looking distinguished and lovely. Thanks to the wonderful new open park in front of it, it has been given the stately space it deserves — what may be Dallas’ most beautiful building is finally able to be fully admired from a respectful distance. Top photo from the book Historic Photos of Dallas by Michael V. Hazel (Nashville: Turner Publishing Co., 2006). Quote from Municipal Journal, Vol. XXXVI, No. 19 — May 7, 1914. Newspaper photos and clippings as noted. 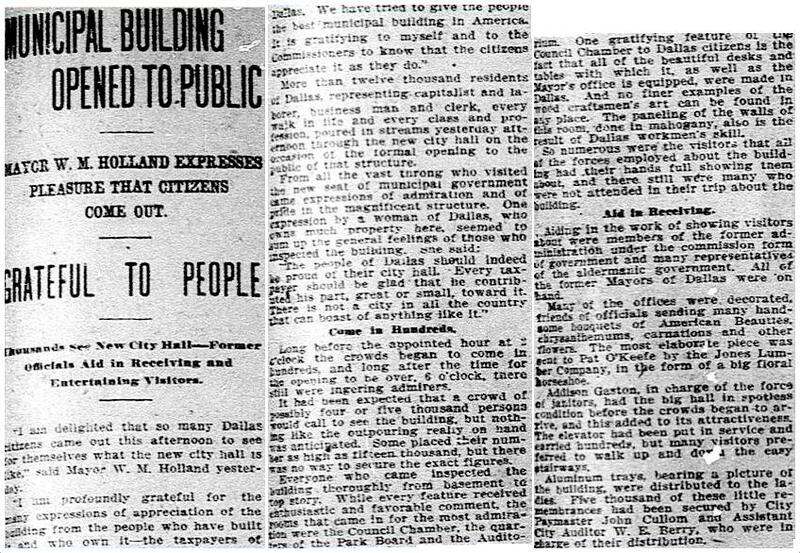 For a detailed description of the architectural details, design elements, and description of office and department locations within the building, see the article “Municipal Building Handsome Structure” (DMN, Oct. 4, 1914), here. I’d love to know more about the little “aluminum trays, bearing a picture of the building” mentioned as being given away on opening day in an article above. There were FIVE THOUSAND of them given away. Surely there are some still around. Has anyone seen one of the these? 1914 Texas Almanac ad for C. D. Hill & Co. Thanks! There isn’t an image. Do you have link? I bet you’re right, Teresa. There have to be some of these lying around town somewhere! Thanks! I think that third floor auditorium (or least part of it) still exists. Until a few years ago it was used as an off docket courtroom and an assembly hall for jury duty. That’s interesting. Imagine a government building that had room for such a large auditorium — and a half-empty top floor! THE ONE GREAT STORY IS that Col Greene who brought the first car too Dallas did live next door, and that was the future in 1914…..odd, and it would stay that way until the 1940’s…Dallas had a big city look in that area from 1914 too 1950’s, then the image faded and people moved to suburbia, thus you can see why the library was also in that area, that was the center of the City for several decades, then Ruby killed Oswald there an the place really has been I am told cursed…..
.we have 3 locations Dallas became centers back then ……Red Court House and records building and jail was one of them…by 1936 the location was in decline as far as central government was in control, since it is really a W.W.1 period location..these are again great images hand colored by Arnold it may be realized…..postcards were sold in Drugstores…..